The QT WebEngineView is the new method of providing applications that display, and interact with web pages. There is some documentation on the QT website on how to implement these functions, with references to the previous QWebView method, but these are lacking examples. 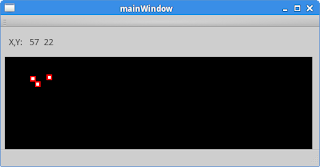 Provide a function to receive information regarding a cursor movement and emit a signal to the main window. Produce a dot at a given X/Y coordinate. Emit a signal (function call) to the QT application indicating the cursor has moved. Include a signal handler to place a large dot at the mouse cursor position, and emit a signal when the mouse is clicked. Some time later (asynchronously), the C++ application receives the message in the "functioncall" slot. 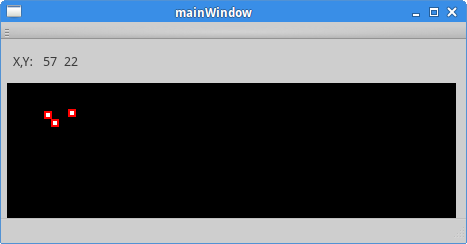 The C++ class emits a signal to the mainwindow to allow the X/Y coordinates to be updated on the screen. Add the "QT += webenginewidgets webchannel" to your project.pro file, and include the appropriate header files, and then in your C++ class / you need to set up the communications channel. Note that 'channel' should be declared in the class header. Then the <body> tag should have an onload="initialise()" option. In the initialise function, the other end of the communications link should be set up, noting that the setting of (in this case) widget is asynchronous to the initialise function call. Note also that 'widget' should be a global variable. Very excellent article which helped me transition, very easily, from my experience with WebKit to the new WebEngine. Thank you so much for a great tutorial. Good stuff. Helped me in my project.